Emotions for Engineers: Does Free Will Exist? Free Will is a slippery topic. We all think we have it and many social systems (e.g. laws, prisons) have it as a very basic assumption. Do we have free will? One view is that, in the end, each of us is just a big bag of chemicals. The chemical reactions in our body determine our thoughts and actions. Therefore, the things we do are simply the inevitable result of our chemistry. I believe there's a lot of merit to that. Any argument on whether free will exists degenerates into circular logic at some point, but there is some research now that is leaning towards lack of free will. Does that mean that we don't have choices in life? That everything is simply pre-determined. I don't think so--not entirely. I think the basic model is correct. 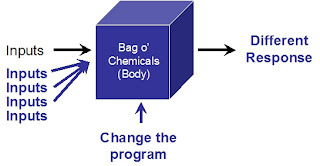 We receive an input, it gets processed through the bag of chemicals and we react or respond. So in a "tactical" sense we do not have free will in that framework. However, I see two places that we can affect our responses. First, perhaps we can reprogram the body. Things like taking care of yourself, getting good night sleep, proper diet, exercise, overall balance between work and family. Think about it. When you're tired your reactions are slower, you're more irritable, you make mistakes. Sometimes not taking care of ourselves can lead to addictions like alcoholism to escape the pain and reality of where we are in our lives. The other thing we can do is alter the inputs. I believe this is a big part of why many "twelve step programs" work. The fellowship between the people in the groups the support, non-judgmental atmosphere, and support for the person provide strongly positive inputs. So even though bad things still happen, they are offset at least to some extent by the positive inputs from the groups. When you hear about people leaving those groups and regressing, it has something to do with the withdrawal of the support system that was helping keep their heads above the water. Again, it gets tricky here. If your bag of chemicals is not predisposed to either get different inputs or stay healthy, then you can not change your responses. There is actually a feedback loop involved between our bodies and our ability to begin to effect changes in our lives. The fact that you are reading this blog means that you are willing to get alternate inputs. Some people will not find redemption through twelve step programs or by taking care of themselves. Your feelings, emotions, and responses are predetermined by the quantity and quality of the inputs and by the state of your body. Excellent Stanford site on Free Will. Everyone believes himself a priori to be perfectly free, even in his individual actions, and thinks that at every moment he can commence another manner of life... . But a posteriori, through experience, he finds to his astonishment that he is not free, but subjected to necessity, that in spite of all his resolutions and reflections he does not change his conduct, and that from the beginning of his life to the end of it, he must carry out the very character which he himself condemns...."
Dan Dennett gave a great talk at TED on consciousness. The decision to reprogram our bodies or change the inputs will still be made on the basis of the model you presented. So the choice to change your state/input would thus not be free, and therefore the new choices/actions that result from the new state/input wouldn't either. That's a really good point. To go even further, it explains why so often, people have to hit "rock bottom" or lose an important relationship before they submit to the instruction they need to learn and grow. I think that for many people it is pretty easy to get into a self-reinforcing spiral fueled by neurochemicals. Then the only way to break the cycle is impetus from the outside. We have to believe in free will. We've got no choice.